Members who attended the hunt at the Tucker House just south of Greensboro this past Saturday enjoyed the day as guests of property owners Jesse McDowell and Jason Greene. In addition to the delicious home-baked goods and drinks, they presented a relatively rare Red Lettered United States Note $2.00 bill to each of the 24 members at the hunt. Finds were numerous throughout the day. Two pistol balls were recovered, as was lots of farm iron and numerous small pieces of metallic trash. Some older clad coins were found as well as small parts to a toy car. The woods behind the former large working farm were searched and the possible foundation area of an old barn was discovered. It was an enjoyable day to be outside and help in the recovery of artifacts and relics from this old homesite undergoing restoration. The Old North State Detectorists Club held a hunt on Saturday November 17, 2012, at the Jordan Cabin in Madison, NC at the request of the Madison Historic Districts and Properties Commission. Jordan Cabin is possibly the oldest surviving building in Madison and could predate the founding of the town by as much as 20 years. It is located on lot 2 of the original Madison plat of 1818. The Club searched lots 1 and 2 for historic materials and all recovered items were turned over to the Historic Commission to catalog and help to further illuminate the origins and history of the Cabin. Items found included two old rings, a 1909 Indian Head Penny, an old bottle, a broach, a clay marble, parts of an old stove door, a Civil War-era axe head, and plenty of farm iron pieces. Members were out in force on the late afternoon of November 7th to locate a lost bracelet in the front yard of a home in Kernersville, NC. While searching, the lady who lost the bracelet actually walked by and spotted it lying in deep grass. Meanwhile, club member Jody Sanders located a child's butterfly ring while looking and found out it belonged to the daughter of the lady with the lost bracelet. 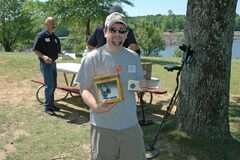 Jody qualifies as the latest winner of the Golden Detector Award and will receive a pin and certificate at our next meeting. Club member Gail Sheffield worked with a property owner to obtain permission to hunt a large 1910-era homesite near Pleasant Garden, NC. The club was allowed to hunt this location before it is bulldozed for future development. 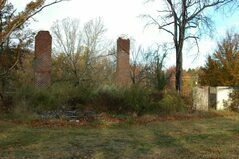 The house has been burnt down, but approximately 11 acres of area provided members an outstanding opportunity to search around the house ruins and old barn, including a rumored old cabin site on the property. Lots of farm iron was found along with some clad coins, shotgun shells, .38 & .45 caliber and 9 MM cartridge casings, silver plated spoons and a Kennedy half-dollar. Two new members were welcomed into the club today at the site. They are Pat Romano and Jonathan Letarde. Thanks for joining us. 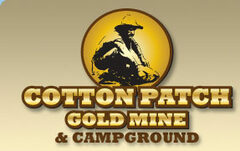 The club meeting for October was held at the site of some old gold pits near Jamestown, NC. The pits have been in existence from the 1850's. The property owners met with the club and escorted the members back into the area where they spread out to cover the area. No gold was located, but some other items found included lots of shotgun shells, bullet casings, a toy cap pistol, an ax head, barbed wire, a nickle, and an old faded tin 'No Trespassing' sign. 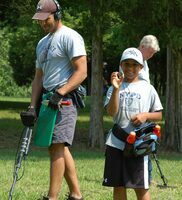 Herb Griffis won the award for the best find today with his toy pistol recovery. He received a 100 Peso Mexican Silver Dollar for his efforts. Steve Cole, a new member, joined us today from Martinsville, VA. 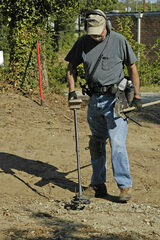 He brings over 12 years experience in metal detecting. Welcome to the club. It was a rainy day, but members brought in their finds to be judged for the award of Best Find for July, August, and September. Norm Birdsall won with the recovery of a brass kerosene lantern wick burner assembly and received a Mexican Silver Peso for his efforts. 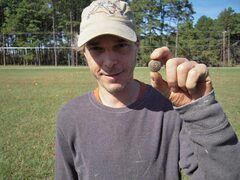 An Honorable Mention goes out to John Young and his U.S. Eagle Button recovered at the Uzzle House hunt and returned to the property owner. 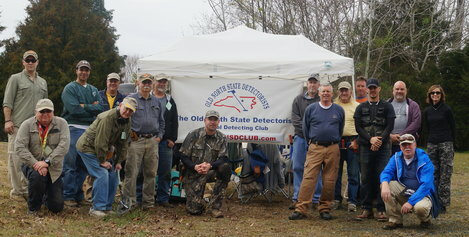 The ONSD Club recently held a special hunt at a 1920's era home just south of Greensboro, NC in an attempt to locate two lost rings, one missing for 6 months, and the other for over 8 years. Over 20 members met at the site and were welcomed by the property owners who provided bagels, coffee, and cold beverages for our refreshment. 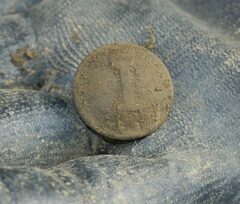 Within an hour after the start of the hunt, member John Young had dug a Civil War Eagle button in great shape. Various other items were found from relics, to clad coins, and trash, but member Jerry Dorsett pulled out the best treasure of the day, according to our hosts. 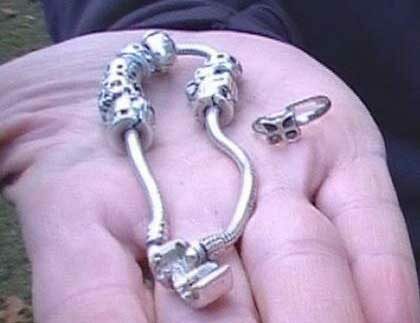 One of the prizes being searched for, a man's ring lost in the back yard for over eight years, was recovered and returned to the surprized owner immediately. Congratulations to Jerry, who will now receive a Golden Detector Award, and to John, along with all the other participants of the day. It was a huge success. The club held its regularly scheduled meeting this day and welcomed three new members, Timothy and Pam Cunningham, and Norm Birdsall. Thanks for joining us! Local author Julia Taylor Ebel presented a discussion about her books and ideas. Julia studies the history of everyday people and writes about how they made a difference in their world. In relating what the club does by recovering relics of the past, she expressed an interest in that what we do also tells a story of past lives and events thru the exibiting of our finds to the public of past activities of so many different people. 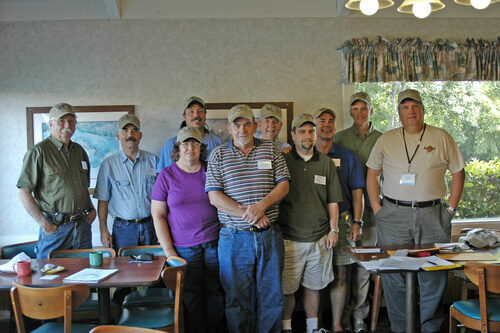 The Old North State Detectorists held their second meeting at the library. The club picked up two new members today and give a huge welcome to Shane White and Jerry Dorsett for joining our bunch. The club has scheduled a hunt for September the 8th to look for a lost ring and other items on some property just outside of Greensboro. Details will be emailed to members as the date gets closer. The Old North State Detectorists pitched a tent at the Village Fair - 2012 held at the Mendenhall Plantation in Jamestown, NC on Saturday, July 21st. Crowds were steady throughout the day and plenty of folks stopped by to say hello and inquire about the articles on display. 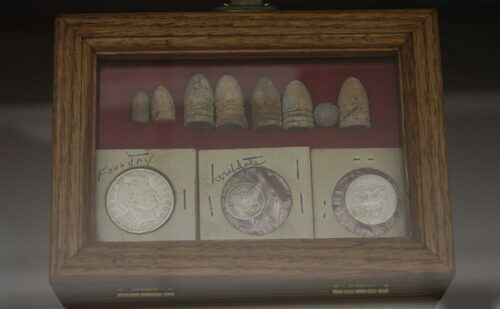 Jim Spivey, Mac McAtee, and Robert Underwood each provided several of their own display boxes of local area and other location finds recovered through the years. 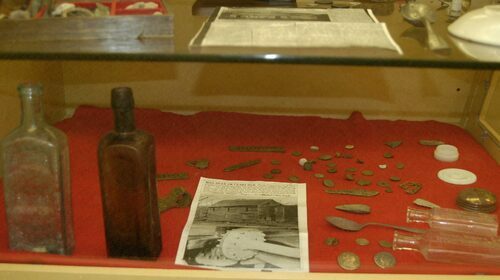 Also on display were relics recovered from the grounds of the Mendenhall Plantation by the ONSD club during several previous hunts and a metal detector to demonstrate how it works for our more curious visitors. Several folks expressed an interest in possibly joining the club and they were asked to join us at our next regularly scheduled meeting on July 28th. Thanks to those members who stopped by to show your support for this activity. Turnout was strong at the first ONSD club meeting held at our new location. Attendance in the Community Room at the Kathleen Clay Edwards Family Branch Library at Price Park in Greensboro, NC numbered 17, including a new member who joined today. Welcome to Tracy Smith. Two other guests were with us today, Nicholas Little and Shane White. The big winner was Jeffrey Blackburn who brought in his June supply of dug relics to claim the silver peso coin for the Best Find of the Month of June contest. 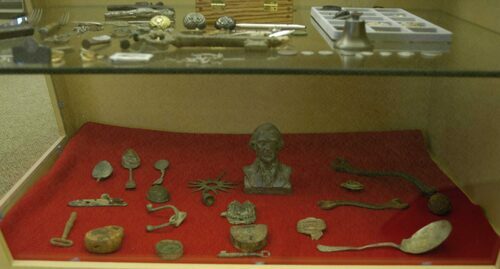 Thom Metz showed his display case of a toy badge recovered at Camp Douglas Long last year. The case is to be donated to the Girl Scout main office at Colfax, NC. Robert Underwood brought in some arrowheads and other items. His find was just featured in the American Digger Magazine's "Just Dug" column. The next issue of Western & Eastern Treasures magazine will feature a cover photo of William Purkey with two Girl Scouts from the Camp Douglas Long hunt back in September of 2011. Now who took that soon to be famous cover photo??? The Old North State Detectorists staffed two tables filled with relics and participated in the fifth annual GenFest 2012 informational fair, focusing on the history, genealogy, and culture of the Piedmont. The fair location was on the main floor of the High Point Public Library located at 901 North Main Street in High Point, NC. Jim Spivey, Mac McAtee, and Robert Underwood brought in several display boxes of items recovered from the Piedmont area. They also answered questions about the displays and passed out ONSD Club information. With over 100 exhibits showing, there was plenty to see. 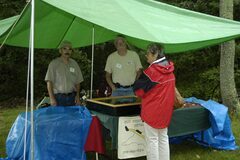 Thanks to Jim, Mac, and Robert for volunteering their time to represent the Old North State Detectorists Club at GenFest 2012. The Club enjoyed a tremendous attendance at last Saturday's seed hunt and picnic. I counted 30 coils on the ground, plus five guests. Everyone I've talked with was delighted with the entire occasion. The affair was enjoyed by everyone, especially Robert Fenstermacher, who carried home the $100.00 ONSD Grand Prize. Everyone contributed to the hunt/picnic by donating prizes and bringing delicious food. Four individuals deserve special recognition: Jim Spivey and Mac McAtee for putting in many hours to set up and run the seeded hunt, and Becky and Skylar Craddock for their hard work in purchasing all the things that are necessary for a well-organized and delicious picnic lunch. Many thanks to Jim, Mac, Becky, Skylar, and all the other club members who contributed to the day's success. The Old North State Detectorists met for a short business meeting and welcomed 4 new members today. Afterwards, an auction was held to raise funds for prizes at the upcoming seeded hunt to be held at Oak Hollow Lake on May 26th. Member Rodney Joslin was the auctioneer and did a fine job of selling items from books to batteries to a metal detector and a cake, helping out the cause. The Club thanks those who donated prizes for the auction and the seeded hunt. Two Golden Detector Awards were presented today. The first to Rodney Joslin for his recovery of a lost gold coin and the second to Randall Woolbright for his recovery of a missing set of motorcycle keys. Club members packed into the Madison Lindsay house at the Mendenhall Plantation once again to meet and plan our future events. 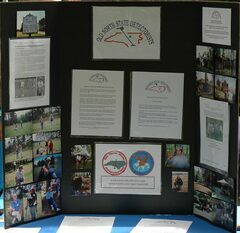 Genfest 2012 in High Point and the Village Fair in Jamestown were discussed as well as the club's Seeded and Competition Hunt scheduled for May 26th at Oak Hollow Lake in High Point. Members were asked to bring and donate items for next month's "White Elephant" sale to be held at the April 28th meeting. The club welcomed five guests who visited us this day. 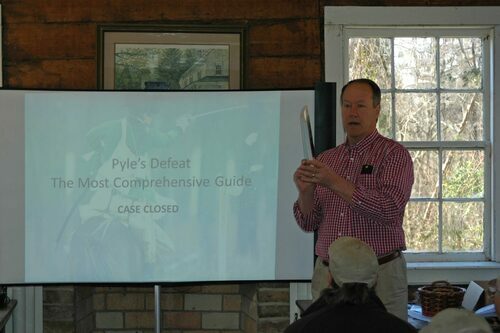 The club was treated to a very interesting Power Point presentation by Stewart Dunaway and Jeffrey Bright, researchers and authors of the book, "Pyle's Defeat - The Most Comprehensive Guide", which details the event. More interesting was the story of how local folklore repeated over time, plus inaccurate printed historical material, placed the battlesite at the wrong location. 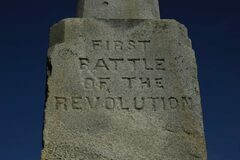 The authors laborious checking of military records, logs, and land deeds, has resulted in the upcoming first-time replacement of a standing state historic marker to correct this updated information about the date of the battle and its actual location. The Battle of Pyle's Defeat was the bloodiest ten minutes of all Alamance County history. On February 24, 1781, a few hundred yards of Alamance County (then Orange County) were stained red with the blood of a few hundred local citizens. Nearly 100 Tory soldiers were killed, with another 100 taken prisoner, wounded, or unaccounted. For generations historians have pondered what really happened at this killing field without any real depth of rationality. Some have just simply replaced fact with convenient speculation of where the hacking actually took place. Our answer to these contemporaries, and their agendas, is the comprehensive presentation in this work, of the letters, memoirs, and field notes of the men who participated. Besides the insight gained from these writings, we provide the reader the proper locations and mileage by plotting the actual routes. It was not our wish when we started this project to revise history, but to correct the myths that have been perpetuated since 1849. After the monthly club meeting, members spent the day in the woods behind the Mendenhall Plantation searching the area around the remains of an old dam. 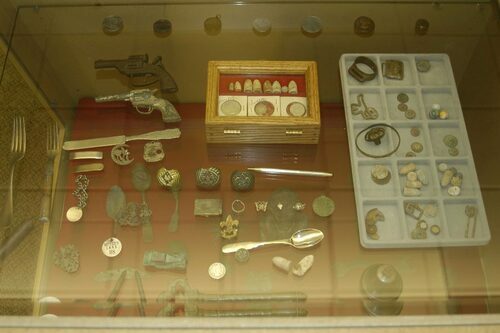 Several items were found including a large cent, musket ball, two saddle shields, a boot spur, the bottom part of a stirrup, a minie ball, a silver 1944 WWII nickel, and a small cuff-type button. The Old North State Detectorists Club held its regularly scheduled meeting today with the highlight being the election of officers for the coming year. Also on the agenda was the presentation of the Golden Detector Award and certificate to Kent Riddle. Local author and historian Mary Browning stopped by to talk to the club about some lesser-known Jamestown activities back in the early 1800's. She is currently researching information for her upcoming book on local history and lore. Dues were collected for the ONSD club and optional FMDAC memberships. The club welcomed two new members today, John Young and Bob Grazioso. Next month's meeting on February 25 will be followed by a continuation of several hunts on the Mendenhall Plantation property. This time the club will be searching the grounds for the remains of a former Tannery shop. 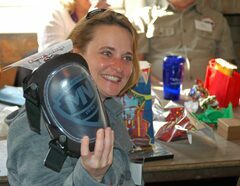 The Old North State Detectorists Club consolidated their November and December monthly meetings into a special day in order to take care of some business and also celebrate the holiday with a Christmas party. Elections Committee members Thom Metz and Bob Fenstermacher advised the club of the candidates slated for the upcoming elections at the next meeting. Nominations were accepted by Becky Craddock for office of Vice-President and Thom Metz for Sergeant at Arms, replacing Jim Spivey who is stepping down. Later, at the party, presents brought in were exchanged by way of holding a "Chinese Auction". Members swapped, traded, and took back previous won gifts by way of the mysterious rules of the game. At the end of the day, all was well and the club adjourned until our next important meeting to be held on January 28, 2012 at which time the club will elect officers for the coming year 2012. Members of the Old North State Detectorists had the Coffin House property in Jamestown, NC to themselves on a nice and sunny, but cool Saturday in a search for relics, Civil War era items, pottery and some old coins. Lots of farm iron was unearthed. A few bottles were found along with some clad coins and a couple of items being a metal tag and a button, which will be researched further for identification. 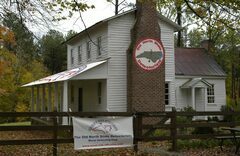 The Old North State Detectorists club has changed its monthly meeting location to the Annex building, located next to the Mendenhall Plantation in Jamestown, NC. Refreshments are provided by the club. Guests are welcome. Please check our Calendar of Events page for the latest club schedules and information. 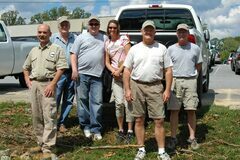 Members of the Old North State Detectorists club met for the second hunt of the Sharpe Farm area by covering a large section of the back area and across the road out front in a search for relics and possible artifacts related to the nearby battle at Alamance or the Civil War era. Several broken horseshoe pieces and other farm-related iron items were found. Nothing battle-related was found. 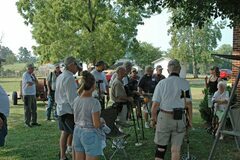 Old North State Detectorists members held the monthly meeting on a special day in order to take advantage of hosting a Cookout and Seeded Hunt at Oak Hollow Lake. The day was chilly and windy, but with enough sunshine to take advantage of a great seeded hunt and cookout. Thanks again to Tammy and Mike Beck for the grill, which made a nice hand-warmer, and Jim Spivey for managing the hunt. Congratulations to all the prize winners. 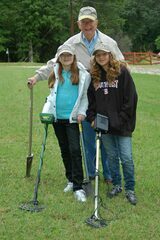 The Old North State Detectorists visited the closed Camp Douglas Long site in a hunt for past relics and artifacts lost at the former location of a Boy and Girl Scout camp which dates back from the early 1900's. Over ten Girl Scouts with their leaders participated in the day's activity in pursuit of a merit badge. Several small items were found. Check our photo gallery at: www.onsd.smugmug.com for a walk-around view. 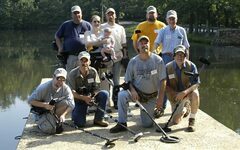 Old North State Detectorists members hunted around the Natural Science Center in Greensboro, NC looking for relics in an area being cleared off for construction. A musket ball and other relic items were found and turned over to our host. On Saturday, July 23, ten tough members of the Old North State Detectorists traveled to the Cotton Patch Gold Mine in New London, NC. The 100-degree heat wave didn't bother us. We were in the shade, a breeze was blowing, and we were panning in cold water. Many thanks to Thom Metz for planning and heading up the visit. Tom even had door prizes of little vials of gold flecks. Members also found a number of gold flakes. Many thanks Thom, for a great excursion. Old North State Detectorists club members Jim Spivey, Mac McAtee, and James Furmage headed up the ONSD booth at a rain-free Village Fair in Jamestown, NC this year. 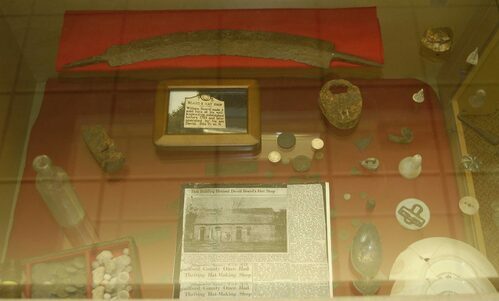 On hand were displays of relics recovered from the Mendenhall Plantation along with other items recovered from the local area and beyond. Informational handouts about the club and what we do were available to the public. Photos can be see here. 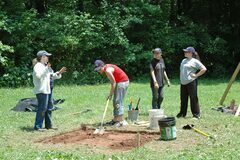 I recently returned on June 25, 2011 from Camp Shenandoah with BSA Troop 98 of Stanton, VA. During campweek, I served as an adviser and assisted with the Archaeology Merit Badge class under Seth Dotson, a recent James Madison graduate in the field. Some of my display cases of Indian, Civil War, and early American artifacts were set up to illustrate and educate our youth on historical cultures. The class also took a field trip on Friday to Thomas Jefferson’s Monticello home at Charlottesville, Va. and met with archaeologists conducting a random grid dig search on a slave cabin at the property. The project is over. We will not be needed anymore. The archeology folks will be working the rest of this week and next week at the site, when they will start filling holes. Thank you all for volunteering your time to help advance the history of the Battleground. Linda Stine asked that a "Thank You" be passed on to all of you. For those who couldn't make it today, I am happy to report it was a good day for metal detecting. Two pieces of cannister shot, a .69 cal. fired musket ball, and a number of buckshot from fired buck and ball loads. Next time you see Jim Spivey, get him to fill you in on his treasure chest. The Old North State Detectorists are making a name for themselves in the archeology community in North Carolina and more opportunities will be forthcoming. Photos are available online here. 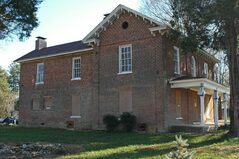 I was recently invited to set up an exhibit of historical artifacts on June 11, 2011 at the open house for the Historical Society of Rockingham County in Wentworth, NC. On display were cases of relics that have been excavated. 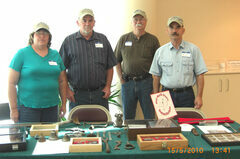 Over twenty years of metal detecting were represented by military items (buckles, buttons, bullets, shells, etc.) from the NC and Danville, VA area, the French & Indian War, and through World War I. 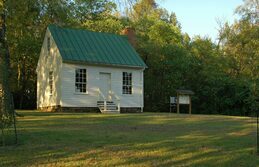 Also exhibited were artifacts of Rockingham County plantations such as Robert Galloway (1783) and William Dearing (1795) along with early cabin sites from 1780-1860. 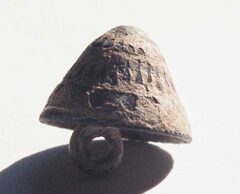 A British button, documented from the 1600-1700 period, dug at the Robert Galloway site, was also available for viewing by the public. Research was discussed on these sites as well as the typology of the collected artifacts to help educate the general population of the importance of preserving our heritage. Club members showed up early to set up the Old North State Detectorists booth and prepare for the day's activities. The day would include displays of relics, demonstrations of the uses of metal detectors, and a seeded hunt for the kids to actually try and locate planted tokens which they could exchange for prizes and a certificate for their participation. 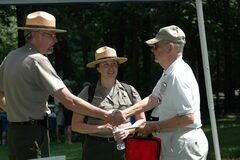 The activities were performed in association with the Guilford Courthouse National Military Park, the National Park Service, the UNCG Archeology Program, and the Guilford Battleground Company. Old North State Detectorists members recently assisted the University of North Carolina at Greensboro's Archeology Department and Program staff, the Guilford Courthouse National Military Park, and the National Park Service in Greensboro, NC in an ongoing search to locate the original site of the Guilford Courthouse which stood near the area of Stop 6 on the battleground trail. Several artifacts were found, including a piece of cannister shot by Jim Spivey. Below is a listing of participating members. The Old North State Detectorists club welcomed a guest speaker today to our meeting. Jerry Barbee of Barbee Detector Sales in Burlington stopped by and gave a short talk about his metal detecting experiences. The talk was very informative and covered his beginning interest from finding money under some old house steps to the latter day of selling metal detectors in his own shop. The audio file is available to open and listen to online or download and hear later at your convenience from the ONSD audio archives located here. The Old North State Detectorists Club held its monthly meeting at Oak Hollow Lake in High Point and afterward enjoyed a seeded hunt at our picnic shelter prior to a cookout at noon. Tammy and Mike Beck headed up the committee that organized, co-ordinated, and oversaw the luncheon event. 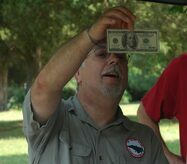 Jim Spivey managed the seeded hunt and provided various prizes along with donated items from members. Our thanks to their great work. 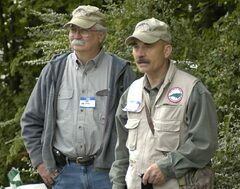 Two new members joined us at the club hunt, Bill Bookout from Greensboro and Jerry Loflin from Jamestown. Several family members attended also. 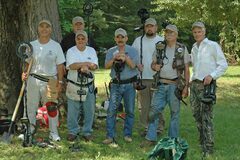 On a bright and sunny day, Old North State Detectorists members enjoyed searching the old carnival grounds in Archdale, NC. Finds included several clad coins and miscellaneous items such as tinfoil and pull tabs. Several new members were welcomed and joined us for the day's hunt. The Greensboro News & Record sent a reporter out to do a story on the club which ran the following week. 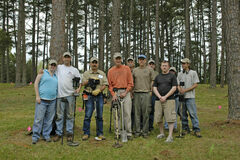 Members of the Old North State Detectorists enjoyed a sunny, but cool day of digging at the battlefield. Several musket balls as well as a button were discovered during a special day to mark the end of the field survey. Now, the finds will be mapped and battlefield positions marked to more accurately represent what actually happened on that day. Old North State Detectorists members Jim Spivey and William Purkey searched the grounds of the Mendenhall Plantation in Jamestown, NC for the sites of the old privy house remains. Two large sunken areas were dug out behind the main house where evidence indicated the outhouses had been. Old North State Detectorists members and guests enjoyed a sunny day at the battleground assisting the NC Division of Historical Sites in the continuing search and recovery of artifacts on site. The find of the day was a Confederate button by Herb Griffis. More shot musket balls were recovered also. Additional photos can be found here at the ONSD photo gallery. Old North State Detectorists members returned to the Old Grist Mill in Jamestown, NC to search around the house area for additional artifacts. Old North State Detectorists members scoured around the mill area and uncovered a few relics such as a large hinge, pottery shards, oyster shells, clad coins, copper tubing, a spoon, and bits of iron. 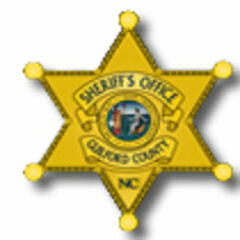 Old North State Detectorists members were called out on short notice to assist the Guilford County Sheriff's Department in locating possible evidence hidden in grass and high weeds at a recent crime scene. No items of interest were recovered, nor photos allowed, but our effort helped in the ongoing investigation. The Old North State Detectorists members enjoyed a picture perfect day hunting around the old Hamilton Lakes swimming area and pier in Greensboro, NC. Finds were few, but included a wheat penny, a small jewelry cross, a White Steamer 1901 auto token, an unusual fishing lure, and a few clad coins. The club welcomed a new member, Thom Metz. 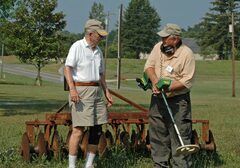 A special monthly Old North State Detectorists Club meeting at the Alamance Battleground Visitors Center Auditorium was followed by a continuation of the battlefield exploration. The 8th Annual Village Fair at Mendenhall Plantation was held on a rainy July 17th from 10:00 am to 4:00 pm at 603 West Main St in Jamestown, NC directly across from City Lake Park. 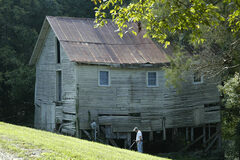 The focus was on the Mendenhall Plantation and village life with the Quakers in the 19th century. There was live music, food, arts & craft exhibits and lots of fun and games related to life on a Quaker farm in the past. ONSD members Jim Spivey and Mac McAtee displayed relics and artifacts found on the grounds of the Mendenhall Plantation by members of the ONSD club. 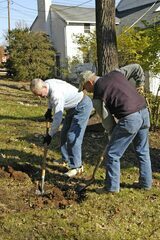 They also performed metal detecting demonstrations and distributed information and business cards about the club. Additional information can be obtained by visiting the Mendenhall Plantation website at: www.mendenhallplantation.orgthen click on "Village Fair". More of the day's photos can be seen here. Club member Mac McAtee sponsored a display in the High Point Library Heritage Research Center. GenFest 2010 was a great success. There were 270 people that attended the festival from all areas of the Piedmont. There were 43 vendors in total, 42 of which displayed items for sale or give-away ranging from free literature on family genealogy to the selling of historical books and maps on NC counties. ONSD members who assisted the GenFest display were Dennis & Tina Sides, Mac McAtee and Jim Spivey. The ONSD display included artifacts, relics, coins and other items from the past and were provided by Mike Wilson, Dennis Sides, Mac McAtee, William Purkey and Jim Spivey. The ONSD display was viewed by many people and received a great review from the public as well as other vendors there. Some attendees had never before seen actual civil war relics, historical buttons, old coins, etc., and were very impressed by what had been found and was displayed. We handed out lots of information about the club and flyers on joining and also how to contact the club for lost item recovery. It was a great show and the ONSD display received lots of attention of the items and of the club itself.